The cervical spine is the part of the spine that is located in the neck area. It is made up of seven vertebral bones that surround and protect the spinal cord (bundle of nerves) in this region. It carries and protects nerves that travel between your brain and the rest of the body. Nerves exit the spinal cord through spaces between each vertebral bone. Compression of the cervical spinal cord or the nerves can occur due to degenerative changes in the vertebral bones or intervertebral discs (rheumatoid arthritis or osteoarthritis), trauma, abnormal spine alignment, infection or a tumor, leading to neck pain, stiffness or weakness in the arms or legs in the area where the nerve supplies. Cervical spine decompression surgery is performed to relieve pressure on the spinal cord or nerves, and alleviate symptoms. Cervical spine decompression surgery is recommended when nonsurgical methods are not indicated or when they fail to reduce symptoms. 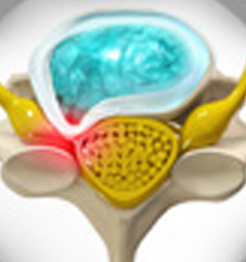 Discectomy: Removal of part of the intervertebral disc, which is degenerated or herniated (bulged). Some of these procedures may leave the spine unstable therefore adjacent vertebrae may be fused during the surgery. Bone grafts, artificial plates and screws are typically used to fuse and stabilize the adjacent bones. As with any procedure, cervical spine decompression surgery may be associated with certain complications which include nerve injury, bleeding, infection and failure to improve symptoms.